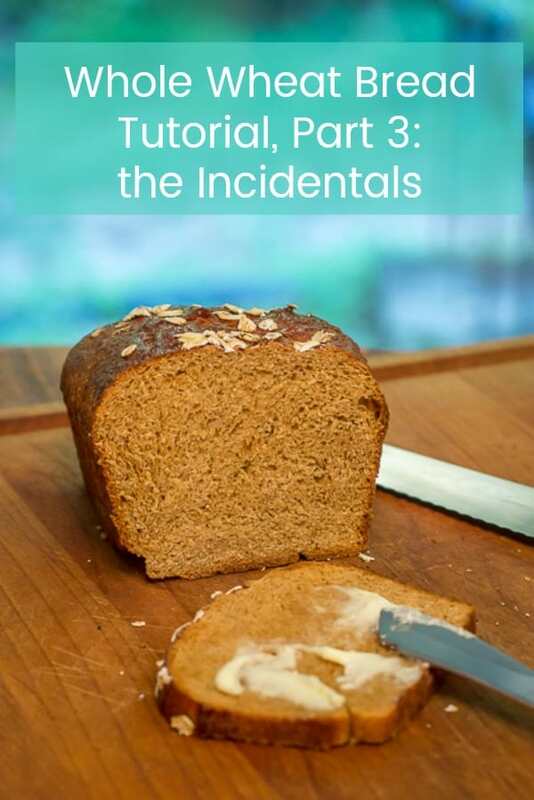 In today’s post, I’m going to cover all the incidentals that I didn’t cover in regard to making whole wheat bread, from flour you grind yourself. My dear little loaves of Whole Wheat Bread, cooling on the rack. So here we go: This is the third post in a series of posts I’ve been doing regarding making whole wheat bread. The first post is here, and in it, I give you all the information you’ll need if you’re deciding whether or not you want to buy a grain mill. My second post is here, and in it I cover all the lowdown you’ll need to know on wheat berries. I give you the actual recipe, in my fourth post. But read this one, first, because I’ve had some excellent questions that I’d like to respond to first. From Gamma lids, to yeast, to sweeteners, I’ll be covering it all. And while these pieces of information may seem like just “the incidentals”, to some of you, I hope they’ll prove helpful to many others of you. What’s a Gamma Lid, and How Does It Relate to Whole Wheat Bread? I had a couple of questions from Stephanie and Anne in regard to the tops to the wheat berry buckets that I use, which are called Gamma Lids. I use them because they convert a plastic bucket into an airtight, reusable plastic container that never causes me to break a fingernail, since the lids easily screw on and off of the buckets. No prying required. They come with an adapter ring that can be installed on the bucket with a rubber mallet. I got mine when I made my first wheat berry order, from the a bread baking store. That’s why I purposefully ordered my first wheat berries in a plastic bucket. From then on out, I ordered the sacks of wheat, which are a bit cheaper per pound than ordering wheat berries in a bucket. How Much Flour Per Cup of Wheat Berries? Next, Stephanie asked me a question in regard to how much flour you get per cup of wheat berries. As best I can tell, Stephanie, you get slightly over a cup of flour per cup of wheat berries. 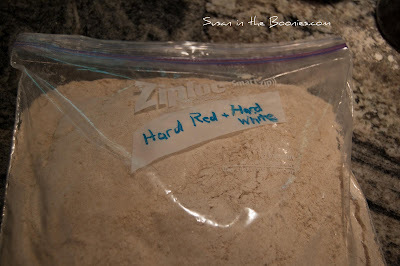 When I go to make this recipe for two loaves of bread, which requires 6 cups of flour, I typically grind 6 cups of wheat, which will leave me with some leftover flour. I always freeze whatever flour I have leftover, marked with the type of wheat berries it came from. Freezing freshly ground whole wheat flour is important, because left at room temperature, the oil from the wheat germ will oxidize, and cause the flour to go rancid. Even though pastry flour might be first choice for pancakes, the hard wheat flour blend that I grind for bread also works just fine for pancakes, too. They might have a texture that is slightly different, but we like them just fine! 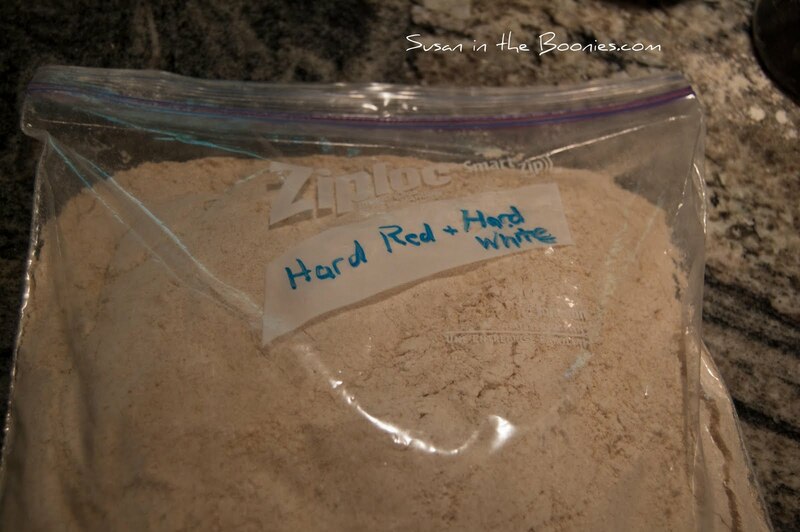 Whole wheat flour labeled for storage in my freezer. How Long Does A Sack of Wheat Berries Last? One more question from Stephanie that I find almost impossible to answer. Stephanie asked how long 45 or 50 lbs. of wheat berries typically last me, and Stephanie, I can only say that varies greatly, on how much baking I’m doing that time of year. They last me a long time: months and months. But there are other families who blow through their wheat berries a lot more quickly than I do. You just have to pay attention to the level in your bucket, and your typical order time, and allot yourself enough time not to run out based on those factors. (Or…if you happen to know any prophets named Elijah…and you don’t mind becoming a widow, in Nain…it can last a lot longer….) Sorry that answer isn’t more helpful. I buy a 2 pound bag of it from Costco, (Red Star is the brand they have at my local Costco) and store it in the freezer in a zip lock bag. What I’m currently using, I keep in a Fleischmann’s yeast jar in the fridge that I refill from the freezer bag. That system has worked well for me. When I proof my yeast, which just means dissolving the yeast in warm water and giving it 5 minutes or so to bubble to “prove” to you that it’s alive, I do two things, that I think are worthwhile. First, I check the water’s temperature. Water that is too hot can kill yeast. 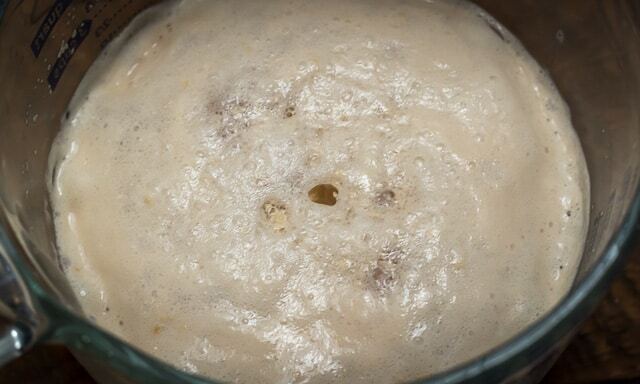 Don’t kill your yeast! What has it ever done to you? (If you’ve ever had a yeast infection, this is not the time to bring that up!) Your water’s temperature needs to be pretty close to body temperature: around 100º is about right. Yeasts need sugar to grow, so stir in either a teaspoon of sugar, or a teaspoon of flour, to give the little yeasties something to eat. And then stir your yeast into that solution. The yeasties will thank you by bubbling up nicely, proving their worth. 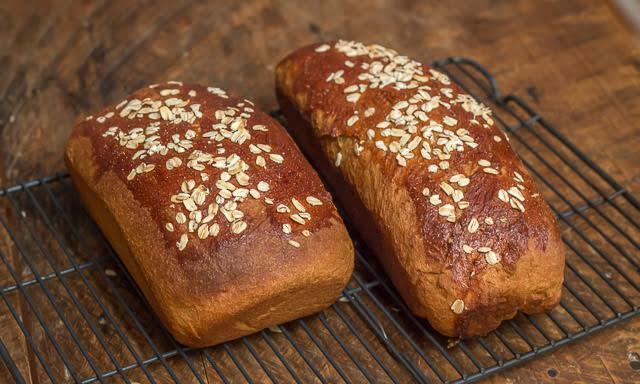 What Do You Use to Sweeten Your Bread? Answering all my reader’s questions about Gamma lids for grain buckets, and the other ingredients I use in my recipe for Whole Wheat Bread. Save this info on Pinterest, or share it with your friends, please. Ask me any other questions you’d like, or share with me your baking experience, too. I am always eager to grow and learn! Next post? The recipe!